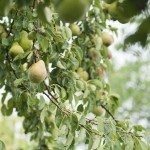 I have a beautiful Cleveland pear tree in my backyard. It is about 4 years old. The leaves have started turning a bronze tan color, starting from the outside of the leaf to the center, then the whole leaf is no longer green and starts falling. 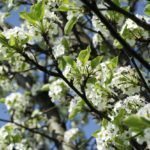 There is a younger Cleveland pear planted about 6 feet from it and it is ok. Any ideas? Could it be spider mites? The tree is going dormant for the season. The smaller tree will follow suit very soon.